Notes: The North American adaptation by Nelvana, named CardCaptors, is discussed in a separate review, as it is as faithful to the original as Robotech is faithful to its component series. As of the 31th of December 2006, Geneon has lost the license to this show. Card Captor Sakura is one of the cutest shows we have seen in a long while, and we will confess it's one of our current must-haves. We finally managed to get our hands on the first season (or so) of it, and we want more! The characters are wonderful, especially Tomoyo (Christi's favorite), and the animation is above average. Not only that, it achieves what one would think is impossible nowadays: a fresh spin on the concept of magical girls. It borrows a little from every show of its kind before it, including Sailor Moon, but manages to come up with something unique. Yes, Sakura has a duty to fulfill, but darn it, she's gonna have fun while doing it. And her best friend gets in on the fun too without having to be a magical girl herself. And Kero-chan is as much mischievous as he is helpful, and has a more fleshed-out personality than previous familiars. He doesn't exist to nag Sakura, for he feels gathering the Clow is as much his responsibility as it is hers, an attribute sorely lacking in most magical girl familiars. Card Captor Sakura is has been one of most popular shows in Japan for quite some time, and there is a good reason why. It's really, really good. In Japan, Sakura was one of the shows that toppled Pokemon from the ratings, so, as a result, Nelvana picked it up to release here as the Next Big Thing. Unfortunately, they've skewed the show so far off true in their dub, CardCaptors, that the show isn't even cute anymore. (Not to mention Sakura isn't even the focus of her own show anymore!) The dubbed adaptation, however, is different enough to merit its own separate heading and review. 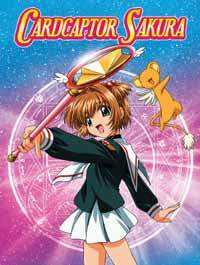 Thank goodness Pioneer has released the subtitled DVD, as Card Captor Sakura really deserves far better than what Nelvana has put it through. The dub simply can't compare to the original, so we therefore can't help but recommend the Japanese version. But darn, if it isn't a good excuse to get your young ones to learn to read subtitles.